This project continues to study mercury removal from Oxy-fuel flue gas to reduce the associated costs and risks. It aims to quantify the extent of removal and the impact of impurities (SO3 and NOx) in the CO2. 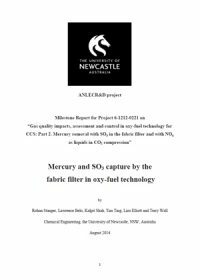 This report focuses on removing mercury with the presence of SO3 in the fabric filter. It concludes that, for practical carbon-in-ash levels, the competition between mercury and SO3 by ash can be neglected. Post combustion capture of CO2 in power generation using commercial amines results in a significant efficiency loss (25-30%). Using an aqueous ammonia solvent can reduce this loss because it has nearly double the carrying capacity and 40% lower re-generation energy among other benefits. Realising this potential requires promoting the rate of absorption and optimising its performance by establishing fundamental kinetic relationships for the reactions. This report delivers the data for the use of piperazine and proline as promoters. Results to date are equivalent to - though have not yet exceeded the performance of benchmark MEA at the high CO2 loadings required for PCC. This project remains in progress. The size and cost of a CO2 capture plant will be directly related to the absorption and separation properties of the capture solvent used. For power generation purposes, commercially available post combustion capture technology is currently considered using amine based solutions, which are estimated to result in about 10% efficiency loss from power plants. This project investigates the potential of using aqueous ammonia as a low energy consuming, high CO2 absorption capacity alternative, with several other associated benefits. Six (6) chemical promoters were tested and the preliminary results show that with the aid of the promoters the mass transfer coefficient of CO2 more than doubled. 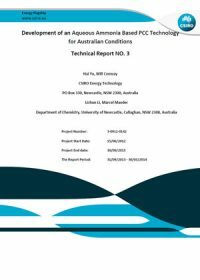 This report details estimates of cost impacts related to coal quality, delivered under a research contract to the University of Newcastle, Australia supported by the Xstrata Coal Low Emissions Research. Costs associated with cleaning of gases from the release of coal sulfur and mercury in oxyfuel combustion for CCS are estimated - these having previously been determined to have greatest coal quality impacts on the technology. 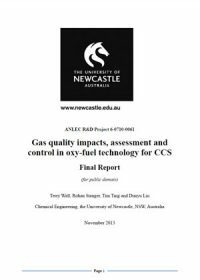 This University of Newcastle study has confirmed the reactions, mechanisms and processes operating that deliver relatively clean flue-gas (carbon dioxide) for storage from the Callide Oxy-fuel Demonstration. The carbon dioxide processing unit design is shown to be effective, where the significant minor components are removed as condensate at the flue gas compression stage prior to transport and disposal. It shows that expensive de-SOx, de-NOx and dedicated mercury removal equipment is not necessary to clean the gas. On-site testing at the Callide oxy-fuel plant has achieved results consistent with those predicted by the laboratory studies. This research has done ‘outstanding work’ according to the Project Director of the Callide Oxyfuel Project (COP). 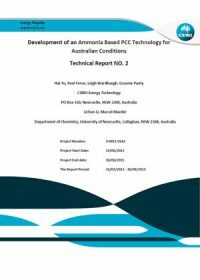 As part of a larger program of study underway on alternative air separation technologies carried out by The University of Newcastle, this project focuses on practical issues related to integration and adaptation of Chemical Looping Air Separation (CLAS) type units into conventional combustion and gasification plants. This interim report provides an introduction of the CLAS methodology and initial laboratory scale experiment results. With the absence of back-end cleaning Australian flue gases derived from oxy-fuel combustion are expected to have higher levels of contaminants. This report provides an assessment of NOx and NOx/SOx mixture behaviour under pressure in controlled wet and dry conditions. It is part of a larger study on the interaction of NOx with SOx as well as Hg in a wet environment, such as during compression. The experiments conducted, have established the feasibility of CO2 gas quality control in oxy-combustion technology by removal of SOx and NOx gas impurities in condensates as liquid acids during compression. 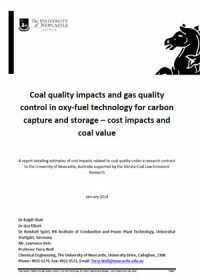 This study by Newcastle University focuses on the impact of coal quality, such as coal impurities, on performance of Oxy-pulverised fuel (PF) technology for CCS. The impurities examined in detail by this research include: sulphur, mercury, nitrogen and others. The impact of impurities varies significantly for pre- and post- combustion technologies. A literature review highlights Oxy-PF flowsheets from different gas vendors, and cost breakdowns are provided to evaluate the impact of gas impurity in oxy-fuel technology performance. This Newcastle University report describes a laboratory experimental program that examines gas scrubbing prior to CO2 compression to remove certain gas impurities. A laboratory-scale well stirred reactor (WSR) is developed to contact continuously flowing gas with a fixed liquid volume, used in a semi-batch mode, for examining the absorption of various SOx and NOx from oxy-fuel flue gas. The experimental operating conditions are based on pilot plant data and it is concluded that gas absorption rate is likely to be impacted by various factors, including gas phase concentration, gas phase diffusion, gas solubility and liquid phase diffusion and reaction. The results indicate that operational conditions can be selected to minimize the consumption of the NaOH reagent yet still allow high rates of absorption during scrubbing. That is, a pH value window between 4 and 5.5 is implied for operation of practical scrubbers. Operation at pH value higher than 5.5 may lead to loss of caustic solution.